A large and enthusiastic audience at the State Street Church greeted the Portland String Quartet for the opening of its 1999–2000 season. Although the program was all late Mozart, it did not suffer from sameness, ranging from the sprightly to the tragic and back again. Major contributions were made by violist Graybert Beacham and clarinetist Karen Beacham. The first offering was one of Mozart's "Prussian" quartets, K. 590, commissioned by the King of Prussia. It has a strong part for the cello, of which that monarch was an amateur, which is most prominent in the first movement. More interesting, however, were the allegretto, with its ingenious toying with a simple theme, and the fugal last movement, when members of the quartet began to listen closely to one another. Graybert Beacham doubled the violas with Julia Adams in the second piece, the String Quintet in G Minor, Opus 516. This is a dark work, beloved of Tschaikovsky, whom it anticipates to an uncanny degree. I particularly liked the close harmonies in the adagio. My theory about the lilting rondo, which seems out of place at the end of a tragic work, is that it is a Beethovenesque joke. Beethoven often made fun of emotional responses to his work. I think, without the slightest bit of evidence, that Mozart decided to show that he could create a cheerful movement using the traditionally sad "dying fall" of a descending scale, which would have all the more impact after three and a half movements of sturm und drang. The deservedly popular Clarinet Quintet in A Major, K. 581, ended the program with a flourish. Karen Beacham was up to the considerable demands of the clarinet part, and in addition has the liquid sound that must have delighted Mozart with the early instrument. The Quartet had excellent ensemble, continuity and flow, but I was distressed sometimes by the number of off-pitch notes in the high and low registers. This seldom happens when the group is performing new music. Could it be that Mozart is so familiar that it does not appear to require as many rehearsals? The audience did not agree with me, and gave the last quintet a standing ovation. September 28, 1999, page 8B, Portland (ME) Press Herald, ©1999 Blethen Maine Newspapers, Inc. The small audience that braved the snow Friday night for the Nordica Trio concert at the University of Southern Maine's Corthell Hall in Gorham was rewarded with one of the best chamber music performances this winter. I would call it a jewel, except that the word implies smallness, and the trio, augmented by French horn player John Boden, had a surprisingly powerful dynamic range. This was particularly evident in the last work of the evening, the great Brahms "Trio for Piano, Violin and Horn," Opus 40, played by Boden, violinist Graybert Beacham and pianist Yuri Funahashi. The playing was little short of inspired, and led to a well-deserved standing ovation. Beacham and Boden exploited Brahm's harmonic sweetness to its full extent, but the crowning achievement was the trio's near-perfect coordination of tempo, volume and intonation. Couple that with real passion and enthusiasm, and one has a performance to remember. The melodic adagio was outstanding and the rapid repeated horn notes of the finale were executed in virtuoso style. Funahashi drew gigantic Brahmsian chords from the hall's controversial new Steinway without ever overpowering the other voices. I haven't looked up the genesis of the trio, but its opening theme is a motif reminiscent of American Indian materials used by Brahms' protege Dvorak in his "New World" symphony. The thought was prompted by the publication date of 1865, just at the end of our Civil War. I have heard this trio in the alternative version, with viola rather than horn, and horn is better, much better. The Nordica Trio consists of Beacham, Funahashi and Karen Beacham, clarinet, but has been working with Boden, principal horn of the Portland Symphony Orchestra, for some time. Another result of this collaboration was a marvelous "Trio for B-flat Clarinet, F Horn and Piano" by American composer George Rochberg. The trio, written in 1948 and revised in 1980, is tonal and easily accessible on first hearing. It is also fiendishly difficult and extremely tightly written. There is not a self-indulgent note in the score. That it was negotiated so well, and still managed to convey deep feeling, should have indicated that a good Brahms was to come. (One always hopes.) The adagio, in which minor thirds are explored by the clarinet and muted horn, did indeed sound like a new "single instrument," as Boden asserted in his opening remarks. The evening began with the late Hovhaness trio, "Lake Samish," Opus 415, composed in 1988 on the shores of that lake in the Pacific Northwest. The composer uses typical Armenian and other folk materials to paint a tonal picture of the lake in various moods, more successfully than most ventures in that form. Hovhaness's own program notes, with their "celestial motets of interstellar space," read like a press release, but the work, lovingly played, lived up to the notices. Sunday, February 4, 2001, page 9E, Portland (ME) Press Herald, ©2001 Blethen Maine Newspapers, Inc.
Half a churchful of fortunate people braved icy roads Saturday night to hear the Nordica Trio at the United Baptist Church in Lewiston. The concert, which included five full-length pieces, seemed all too short. 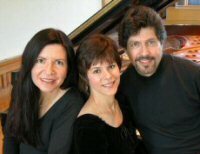 The Nordica Trio, consisting of Karen Beacham, clarinet, Yuri Funahashi, piano, and Graybert Beacham, violin, has been playing together for about six years, and has discovered a wealth of interesting music for its particular mix of virtuosity. A wonderful Bartok piece, "Contrasts for Violin, Clarinet and Piano" was written by the composer in 1938 at the request of violinist Jospeh Szigeti, who wanted something he could play with Benny Goodman. It was premiered at Carnegie Hall in 1939, with Goodman on the clarinet. "Contrasts", which consists of a dance-like first movement, a slower "restful" midsection, and a fast finale, is built around tritones, intervals of an augmented fourth -- from F to B going up the scale -- that early classical musicians called "the Devil in music." Just to show how uninhibited he was, Bartok composed one section for a violin in special tuning that permitted it to play two of these compositional no-nos at once. Bartok seemed to think that the clarinet and the violin didn't really belong together, and in "Contrasts" emphasized their differences. He may not have heard the two Haydn trios that began the program, in which the voices are so perfectly woven together that it is sometimes hard to tell which is which. The two works played after intermission were also great finds. The first was a suite by Darius Milhaud, which includes a fantastic parody of the type of trio music that used to be played in the Palm Court of the Plaza Hotel, yoked to some infinitely sad melodic lines, as if a friend were continually urging the composer to cheer up. The last work on the program, a pleasant suite by the contemporary Armenian composer Alexander Arutiunian, was a reminder that there is a lot of life still left in tonal music based on folkish themes. Both the individual playing and the total ensemble were virtually flawless in every work, no matter how difficult. Better still, the musical character of each was shaped with taste and imagination. This concert will be played again, under the auspices of the Maine Music Society on Saturday at the Second Congregational Church in Norway. It should not be missed. Monday, January 18, 1999, page 3C, Portland (ME) Press Herald, ©1999 Blethen Maine Newspapers, Inc. The concert of the Maine Chamber Ensemble at the United Baptist Church in Lewiston, scheduled for Jan. 17, was postponed to Jan. 30 because of the weather, which was bad again Friday. A large audience arrived anyway to hear Schubert's Octet in F Major and the Dvorak Quintet in E-flat Major, both monumental works. The two alone, before and after intermission, provided a longer than normal program. The Octet, originally planned for performance without a conductor, was led by the orchestra's artistic director, Peter Frewen, because of difficulties in coordinating the strings and woodwinds due to the acoustics of the church. The sound is good for the audience, but there are time delays in the echoes that affect groups larger than a quintet. Even with direction, the sound was a little ragged at first until the players got comfortable with one another in the third movement, allegro vivace. The andante, with its theme and variations, was even better, with particularly good harmony between the strings and the woodwinds. In this late work, Schubert was enamored of the French horn, and the piece seems to foreshadow the Brahms 4th Symphony. The horn part was played admirably by John Wheeler, but one could see why Frewen decided to conduct. The sound of the horn ran around the church like water swirling in a bowl. Karen Beacham was particularly good on the clarinet part, one of the landmarks in the literature for that instrument. The Dvorak Double Bass quintet of 1875, dedicated by the composer "To My People," is a relatively early work with a strong basis in Czech folk tunes, and some dramatic effects straight out of the composer's experience as an itinerant violinist. It is a gorgeous work, however, which won the Artistic Circle of Prague competition when it was first written, and was attacked with vigor and feeling by the quintet. The addition of the double bass (contrabass in the program) to the string quartet frees the cello from its duties as a basso continuo, and allows it to become more of a melodic voice, well sung by Kathleen Foster. The melodic third movement, poco andante, was the high point of the evening, and earned the performers a standing ovation. The quintet, as played Friday in its more popular form, has only four movements. A fifth, andante religioso, was restored by musicologists in the 1960s, and appears in the Portland String Quartet recording of this work. February 1, 1998, page 8E, Portland (ME) Press Herald, ©1998 Blethen Maine Newspapers, Inc.
Two trios got three curtain calls from an audience of four dozen in the intimate recital hall of the Portland Conservatory of Music on Friday night. Andrew Pelletier (French horn) and the conservatory's director, Carol Eaton Elowe (piano) were joined by Karen Beacham on clarinet for George Rochberg's "Trio for B flat Clarinet, F Horn and Piano" and by Graybert Beacham on violin for Brahms' "Trio in E flat Major." Both trio sonatas got good performances, and drew favorable comments from the listeners at intermission and after the recital. Two challenges face any horn player who is part of a piano trio. For one thing, the horn is unusually susceptible to "fluffs"—reaching for one note in the closely spaced upper harmonics and blowing the one next to it in the series instead. It is to Pelletier's credit that there were remarkably few false notes from his horn during the entire performance. The other problem is balance, especially in a small space. Unless all the members of an ensemble take constant pains to keep their instruments at comparable volume, a horn is almost guaranteed to overpower a clarinet or violin at least some of the time. But these four musicians seemed to be well aware of this problem, and to compensate accordingly. Although the clarinet occasionally was buried during the intricate first movement of Rochberg's piece, the unaccompanied duet that opened its second movement (an exploration of alternating thirds and sixths) was a tour de force of exquisite balance mysterious enough to raise hairs. Rochberg's witty finale was a delightful romp whose fast 3/4 rhythm almost came unglued at one point but was quickly recovered, and the interplay of voices in its fugal sections was a contrapuntal joy. In contrast to Rochberg's 20th-century tonal liberties, the Brahms horn trio's romantic harmonies seemed tame. But both works, though separated by 90 years, display their respective composers' facility for writing good counterpoint, and the Brahms offered plenty of rhythmic trickery, such as staggered accents and hemiolas in triple-beat passages, to test these performers' skills. Graybert Beacham's violin has an unusually rich tone, which was a great help in mitigating some of the balance problems implicit in Brahms' score. He and Pelletier luxuriated in their lyric solos of the first and third movements, whose palpable melancholy contrasted agreeably with the bouncy second-movement scherzo and a final allegro in an irrepressible 6/8 evoking hunting-horn and the steeplechase. May 25, 1996, page 8B, Portland (ME) Press Herald, ©1996 Blethen Maine Newspapers, Inc. The Nordica Trio—Graybert Beacham (violin), Karen Beacham (clarinet) and Yuri Funahashi—gave an exciting performance of four sonatas from three centuries Friday night. Their faculty recital at the University of Southern Maine drew a near-capacity audience to Corthell Hall on the Gorham campus, and the crowd loved what it heard. The ensemble, based in Farmington, excelled in Khachaturian's orientalist "Trio for Clarinet, Violin and Piano," redolent with a folk declamatory style harking back to the mountainous Caucasus district of the composer's youth. This piece was a banquet of dead-accurate double stops on violin and lyric, soaring melodies on clarinet. Sometimes the Beachams doubled each other at the octave or played in fourths while Funahashi's driving keyboard provided a solid rhythmic underpinning. Karen Beacham plays wonderfully: now velvet-smooth, now agile. It would have been a pleasure to hear her in other works. But the violin-piano sonatas which made up the rest of the recital were by no means inferior. In Telemann's miniature "Sonata in A Major," which opened the program, Graybert Beacham showed a judicious use of vibrato and a deft, light touch appropriate to this rococo piece. Unfortunately, Beacham's violin would have been better balanced in this piece by a delicate realization of figured bass on harpsichord. Though Funahashi played with admirable restraint, the heavier sound of her piano tended to overpower Beacham in his lowest octave. But most of the sonata was satisfying, the adagio especially so. A similar problem dogged Beethoven's "Spring" sonata: Early 19th-century keyboards were far lighter in touch and fugitive in tone than modern concert grands, making left-hand chords which were distinct for Beethoven sound muddy today. And once again, alas, Beacham's low notes tended to get buried. But these were minor distractions in an otherwise charming performance of this familiar work, in which, for the most part, Beacham and Funahashi were a tight duo—sometimes thrillingly so, as in their extended shared trills at the end of the adagio second movement and the witty, staggered-stress scherzo of the third. Most effective of the three violin-piano works was the final offering on the program, the "Sonata No. 3 in D Minor" by an aging and increasingly disillusioned Brahms. Its tempestuous opening was a vigorous workout for Funahashi, who mopped her brow before she and Beacham settled into the melancholy grandeur of its adagio, an aria full of luscious double stops and an almost unbearable sense of pathos. This sonata demanded consummate technique and control from both violinist and pianist, and they delivered handsomely. Tension built through the final two movements to a climax which drew loud applause and two curtain calls, with Karen Beacham returning to the stage for the last long hand. Saturday, March 18, 1995, page 4B, Portland (ME) Press Herald, ©1995 Blethen Maine Newspapers, Inc.
Not all ensembles burst on the music scene in a dazzling flash of publicity and a flourish of trumpets. Despite recitals last season at several halls in Maine, the Nordica Trio—Graybert Beacham (violin and viola), Karen Beacham (clarinet) and Yuri Funahashi (piano)—has seemed almost reticent about promoting itself. Friday's recital at the University of Southern Maine may change all that, thrusting these reluctant virtuosos into the limelight willy-nilly. In the fifth of this winter's faculty recitals (Graybert Beacham teaches at USM and Karen Beacham at Colby), the trio will play works of Beethoven, Khachaturian and Brahms in Corthell Hall on the Gorham campus, starting at 8 p.m. Admission is $8 ($4 USM faculty and staff, senior citizens and students). Sunday, March 12, 1995, page 3E, Portland (ME) Press Herald, ©1995 Blethen Maine Newspapers, Inc.